"When a man wants a thing, the universe conspires to make it happen." - Paulo Coelho (in The Alchemist). This is true as God has prepared everything needed for us to succeed once we put our hearts to it. 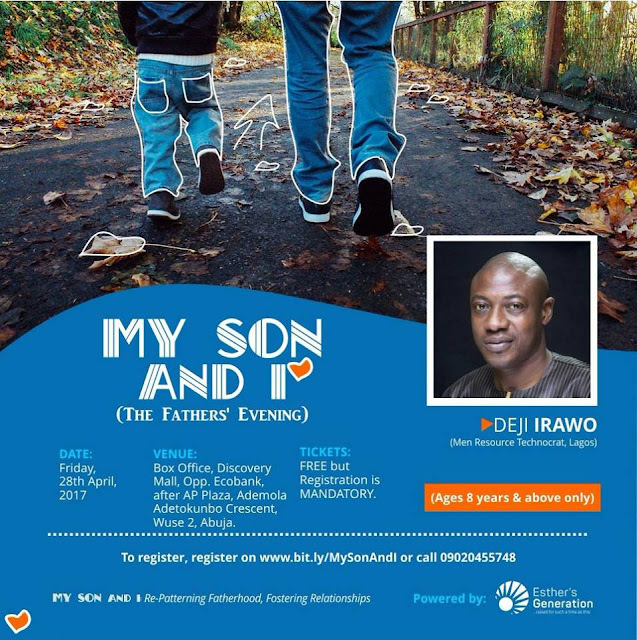 One of our long standing supporters who requested to remain anonymous has graciously made the event #MySonAndI #FREE for fathers! Whoooops! I'm super excited that men are beginning to respond positively to this call despite their tight schedules and efforts to ensure the family is protected. This offer is not open-ended as only 35 fathers would be lucky to enjoy this sumptuous offer. So, fathers who truly love and desire to be a part of this should rush to our link http://bit.ly/MySonAndI and register NOW! Kindly send an SMS indicating 'Sponsored' to 09020455748 with your name and son's name (if any). Mothers with dual roles can apply too. Please note that ONLY THE FIRST 35 PERSONS TO REGISTER will be considered for the sponsorship. Kindly pay attention to the little adjustment as regards the venue on the flier. Anonymous, God bless you real good!